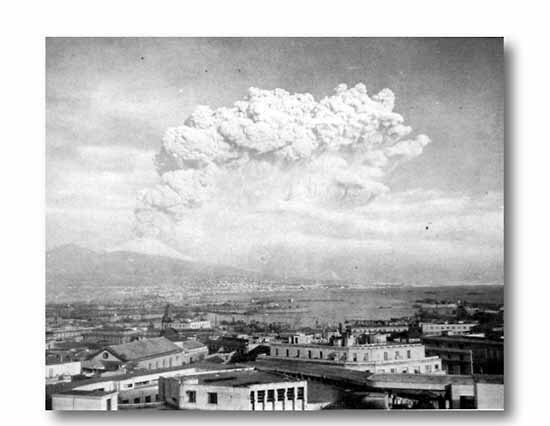 Belching billows of lava dust and smoke violently surged skyward as Vesuvius erupted in March, 1944. While the Division was being rehabilitated in the Maddaloni area, Mt. Vesuvius spurted forth its most violent eruption in 72 years. During windy March evenings GI's stood in awe, watching the volcano spout its flame-colored lava out into the night. Sulphurous lava enveloped San Sebastiano at the foot of Mt. Vesuvius and threatened the entire surrounding coast. Italian natives became panic-stricken. They had endured the ravages of war, the desperation of hunger. Now they stretched their hands to heaven in protest of the eruption. Allied troops and medical supplies were pressed into emergency service. POMPEII, buried under molten lava from Mt. Vesuvius in 79 A.D., was a highlighted point of interest for all servicemen. Here a guide explains Pompeii history. IN THIS AMPHITHEATRE many centuries ago, condemned prisoners were placed at the mercy of wild beasts to provide sport for the people of Pompeii. The city was unearthed during the 19th century.